…the selection of his work for this prestigious project attests to the value of his stylistic investigations on the contemporary art scene. His presence confirms that creativity is one of the most important means for conveying knowledge. … The imagination of the artist Xhovalin Delia is quite vast and surprising: free and modern, it ranges from paintings of figures to landscapes, the Tuscan hills, the Florentine skyline, from bright, vivid colours to installations, animations, video, and performances, with his feverish, incessant production of complicated, visionary images. His works are abstracted from reality itself rather than from form, contemplative images standing out against dizzying, disquieting backgrounds. Particularly striking are his canvases painted with squares, rectangles and geometric figures composed from soft, ethereal touches of colour that surround larger figures. These in turn are filled with other rectangles and squares that give a glimpse of further depictions, assembled in a seemingly confused manner but one that is precise and oriented inwards, asking for answers and inviting the viewer to profound reflection. The artwork of Xhovalin Delia brings to mind the words spoken by Hans Arp on the Surrealist movement: “We do not want to reproduce, we want to produce. Just as a plant produces a fruit. We want to produce directly and without meditation”. Qualitatively and conceptually, Delia’s work does not put situations on stage, but rather luminous visions that show the contact existing between situations retrieved from the traditions and innovations of modern expressive technology. Delia offers us a series of visions, metaphysical apparitions, and conceptual interplay between what is shown in the work on an underlying level and what the image means in its aesthetic impact; the image provides a means of interpretation that must be decoded and deciphered. In the field of contemporary art, Delia maintains a steady consistency in his work and remains ever true to himself, because his creative streak springs forth from the depths of his consciousness. 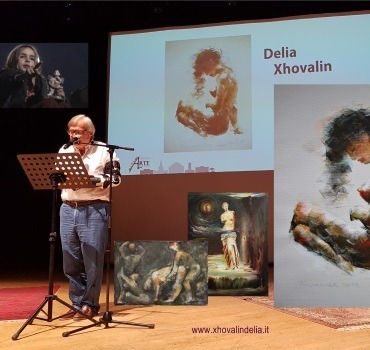 Xhovalin Delia demonstrates an ability to diversify the aesthetic values of his expressive forms and his content in an original way, constantly proposing new content. His art remains the same, and at the same time always varies in the themes that he calls upon us each time to understand and recognise. The invention of Delia’s artistic world evolves continuously and is supported by his mastery of technique. His surprising description of atmospheres and dimensions brings to mind sensations and perceptions filtered by his inspiration and transferred into the works. The art of Delia originates in his innermost ego; it is the invention of a dream that emerges from his mind and heart. Delia’s artwork can be classified between symbolism and a magic, visionary realism. In his artistic “invention”, both thought and instinct, the material and the spiritual, tradition and innovation exist together in harmony. All of these elements are brought together in a blend where thought takes the place of the material. Delia’s work can be contextualised within the movement influenced by Surrealism, in that definition of “action art” given by André Breton that thrives on the relationship between the unconscious and the rational creative act. Based on the statements of Rudolph Arnheim, according to whom the viewer of a work of art also commits a creative act by looking at it, the art of Delia urges us to immerse ourselves in an interpretative projection that is both intriguing and constructive. Xhovalin Delia investigates with his brushes and his tools, in a purely surreal, symbolist, and at times metaphysical sphere, but he does so with a deep awareness of symbols and artistic culture. There is so much personality in his works, and it is easy for the viewer to sense the ecstatic, painterly intensity that gripped the master’s heart while creating, and to feel a part of it, actively participating in a unique artistic experience. His fleeting movements of the brush over the canvas or any other surface he decides to use give us a glimpse of a rebellious spirit free from any kind of creative restriction or stylistic rules; Delia thus succeeds at sparking an intimate conversation with the viewer, using not only a simple visual language, but also an almost playful symbolism that drives us to constantly seek out meanings. The subject areas he explores are many and varied, and whether he is depicting emotions, memories, or something more spiritual, every part will always be a stylistic and aesthetic surprise that never tires the viewer. With simple, direct colour structures, this master brings to completion a subject which is already sophisticated, giving it personality and character. Many-coloured watercolours tell of places of the spirit or intensely experienced moments: thus the artist Delia Xhovalin fascinates viewers with his works, emotional tales translated into lines and colours. Clear references to post-cubist styles emerge: the elements of colour in these compositions connect, creating harmonious counterpoints while maintaining the consistency of the visual proposition, where trees and houses intersect in a chromatic web that is joyously incongruous.